Returning in November, the Wilton Historical Society is presenting the highlight of the season — The 33nd Annual American Artisan Show. The American Artisan Show will take place Friday, November 2, from 10:00 – 5:00 and Saturday, November 3 from 10:00 – 5:00. Admission is $10; under 18 free. Fifty highly-skilled artisans from across the country will be presenting their work and its influences that have been part of American fine handwork since the 18th century. Shaker-style furniture, pottery, baskets, candles, quilts, Windsor chairs, rugs, floor cloths, art, tavern signs, fine jewelry – and even beautifully turned peppermills will be available for purchase. The show is fittingly set in the Society’s charming 18th and 19th century buildings. If you are an artisan interested in participating in the upcoming American Artisan Show, please submit this Artisan Application for our consider ation. 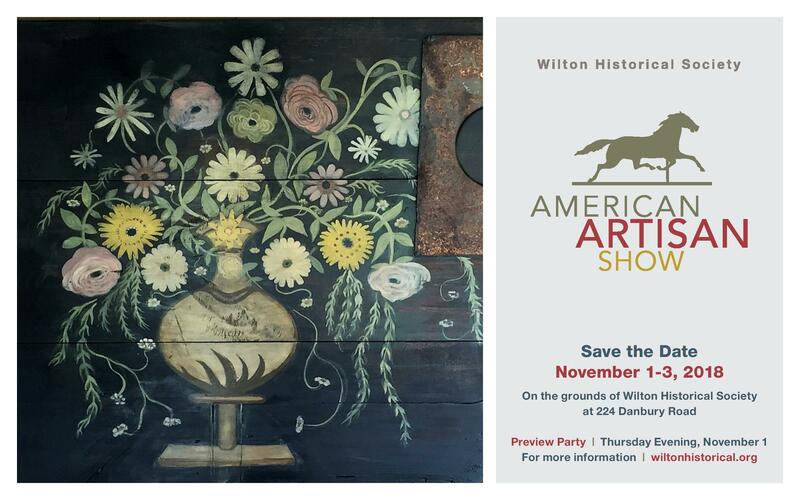 Please email to artisanshow@wiltonhistorical.org. Thank You. The Hilton Garden Inn Norwalk has offered a special rate of $94 a night for all artisans participating in this year’s show. This rate covers Thursday, November 1st and Friday, November 2nd, and includes breakfast. Reservations must be made prior to October, 17th. Reservations can be made by calling (203) 523-4000, or online by clicking here.